ASD-STE100 is maintained by the Simplified Technical English Maintenance Group (STEMG), a working group of the AeroSpace and Defence Industries Association of Europe (ASD). The STEMG was originally formed in 1983 as a working group to develop AECMA Simplified English and subsequently, in 2004, when ASD was created, the group changed its name to the STEMG. The STEMG reports to the ASD Product Services Specification Group (PSSG). The STEMG is composed of national representatives from the ASD member countries in Europe, the AIA in the United States, the ANAC (Civil Aviation Authority) in Argentina and the Union of Aviation Industrialists of Russia. In addition, there are associate members from airlines and users of technical documentation written in STE. 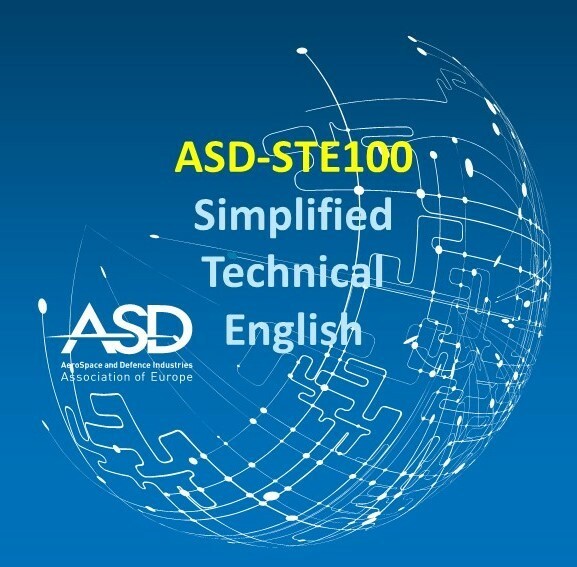 ASD Simplified Technical English, Specification ASD-STE100 (STE), is an international specification for the preparation of technical documentation in a controlled language. ASD-STE100 is maintained by the Simplified Technical English Maintenance Group (STEMG), a working group of the AeroSpace and Defence Industries Association of Europe (ASD). The STEMG is a non-profit group. The mission of the STEMG is to control, develop and maintain the ASD-STE100 specification. •	To keep ASD-STE100 up to date and to improve it as necessary. •	To process change requests (change forms), take the appropriate amendment actions, and release new issues of the specification as and when required. •	To report to the ASD Product Services Specification Group (PSSG) on current activities. •	To give advice and recommendations to STE users. •	To control the production of electronic master files for output and distribution. •	To promote STE in general. •	To protect the integrity of the ASD-STE100 specification. •	National representatives from countries that are not members of ASD. •	Associate members from airlines and military organizations, or other users of technical documentation written in STE. The national representatives (also known as national coordinators) are mainly from the aerospace industry and are nominated by their national associations, companies, or organizations which are part of ASD, or recognized by ASD. The national representatives are the official “voice” of their countries in the STEMG. They are responsible for coordinating STE matters in their respective countries. The national representatives have full voting rights. Only 1 (one) national representative is permitted per country. The national representatives of countries/national associations or organizations which are not ASD members can also be part of the STEMG. These national representatives have full membership and voting rights in the same way as those from the ASD member countries. The total number of national representatives is at the discretion of the STEMG and must not be more than 12 (twelve). The number of national representatives from countries which are not ASD members must not be more than 4 (four). The minimum percentage of national representatives necessary to hold a meeting must not be less than 50%. Each national representative must attend as many meetings as possible and a minimum of (1) one meeting out of (3) three consecutive meetings. 4 (four) consecutive absences without backup representation is grounds for termination of the membership. Associate members are nominated by organizations representing users or producers of technical documentation written in STE. Associate members are entitled to attend STEMG meetings and contribute to discussions and decisions. Only one associate member is permitted per country. The number of associate members is at the discretion of the STEMG and must not be more than 4 (four). The attendance of associate members has no impact on the decision to hold a meeting. Each associate member must attend as many meetings as possible and a minimum of 1 (one) meeting out of 3 (three) consecutive meetings. 4 (four) consecutive absences is grounds for termination of the membership. Emeritus members are former members of the STEMG who have retired or left the group for other reasons. Emeritus membership is granted by the STEMG through an Intellectual Property (IP) agreement to be signed by the emeritus member and the chairperson of the STEMG. The IP agreement regulates emeritus membership duration, rights, and limitations. Emeritus members must have been in the STEMG for a minimum of 5 (five) years and must have attended a minimum of 7 (seven) meetings in this 5-year period. In addition, they must show interest in continuing their active participation in the group activities and in attending meetings. Emeritus members are entitled to attend STEMG meetings and contribute to discussions and decisions. Emeritus members do not have voting rights. Only 1 (one) emeritus member is permitted per country. The number of emeritus members is at the discretion of the STEMG and must not be more than 2 (two). The attendance of emeritus members has no impact on the decision to hold a meeting. Each emeritus member must attend as many meetings as possible and a minimum of 1 (one) out of 3 (three) consecutive meetings. Emeritus members are not national representatives and even if their countries are not represented in the STEMG, they cannot take the role of national representatives. External observers can be invited to attend STEMG meetings on a one-off basis. However, the number of these external observers in a meeting is at the discretion of the STEMG chairperson and must not be more than 2 (two) per meeting. External observers do not have voting rights. Secondary national representatives (also known as backup representatives) are permitted to replace the primary national representatives who cannot attend all meetings. Permanent secondary national representatives are nominated by their national associations, companies. or organizations in the same way as the primary national representatives. They are considered part of the STEMG and are included in the official list of representatives. Temporary secondary national representatives are delegated by the primary national representatives to replace them in specific meetings only. They are not official members of the STEMG and will not be included in the official list of representatives. Secondary national representatives have full voting rights but only for the meetings when they replace the applicable national representative. Only 1 (one) secondary national representative is permitted per country. If authorized by the STEMG chairperson, secondary national representatives can attend meetings together with the primary national representatives. In this case, only the primary national representatives will have voting rights. The STEMG contains a good mix of engineering and linguistic expertise. Members must have enough time and energy to maintain the specification. They must be able to attend meetings and must cover their own expenses. In most cases, their companies or organizations support their expenses and their work. •	Proficient knowledge of English. •	Good experience in the field of technical documentation and the use of STE. •	Basic knowledge of international specifications related to technical publications (for example, S1000D and ATA iSpec 2200). •	The potential national representative must be nominated by its supporting company or organization. These companies/organizations in most cases support expenses and work. •	The nomination must then be endorsed and formalized (usually with a nomination letter) by a national association or organization which is part of ASD or recognized by ASD. •	The nomination letter(s) must be sent by the potential national representative to the STEMG chairperson. •	The national representative membership must be initially approved by the STEMG and finally endorsed by ASD (through the PSSG). •	The potential associate member must be formally nominated by an organization that represents users or producers of technical documentation written in STE. •	The nomination letter must be sent by the potential associate member to the STEMG chairperson. •	The associate membership must be initially approved by the STEMG and finally endorsed by ASD (through the PSSG). Upon completion of the above, the STEMG will vote on whether to accept the new member. A two-thirds majority is required for approval. If membership is approved, the new national representative or associate member will receive all correspondence and be invited to attend STEMG meetings and participate in the discussions. If membership is rejected, the STEMG chairperson will notify this decision to the potential member and explain the reasons for such rejection. The status of emeritus member is uniquely given by the STEMG and regulated by a specific IP agreement. The STEMG members elect a chairperson, who is then approved by the ASD PSSG. The term of office is not limited and is at the discretion of the STEMG. The STEMG also elects a vice-chairperson who supports the work of the chairperson. Because the STEMG is an ASD working group, the positions of chairperson and vice-chairperson must be held by national representatives from ASD member countries. The role of the chairperson is to coordinate all STEMG activities and discussions, call meetings, prepare the associated meeting material, conduct the meetings, and write the minutes. The chairperson, supported by the members, is also the primary point of contact for STE users. The STEMG chairperson is a member of and reports to the ASD PSSG, and is the contact person for the STEMG within ASD. Most of the STEMG work is done at the meetings. STE users can ask for help in understanding STE principles and rules. They can send queries as necessary (usually through change forms) to the STEMG chairperson or to any of the national representatives. The STEMG chairperson forwards the change forms to the STEMG members and keeps a permanent log of all change forms received and processed. At its meetings, the STEMG discusses the proposed changes and decides whether or how to implement them. Periodically (usually every three or four years), the STEMG releases a new issue of the ASD-STE100 specification which contains the agreed amendments. The STEMG usually meets twice a year (spring and fall). Most meetings last 4 (four) days. Each meeting is hosted by an STEMG member from one of the participating countries (on a rotational basis). Associate members can also host meetings. The STEMG contains a good mix of engineering and linguistic expertise. Engineering experts take care of technical accuracy and linguistic experts take care of language accuracy of the STE specification.